In case you were wondering whether or not my bra obsession has subsided, it most definitely has NOT! I have several finished bras to share, and today you get two! 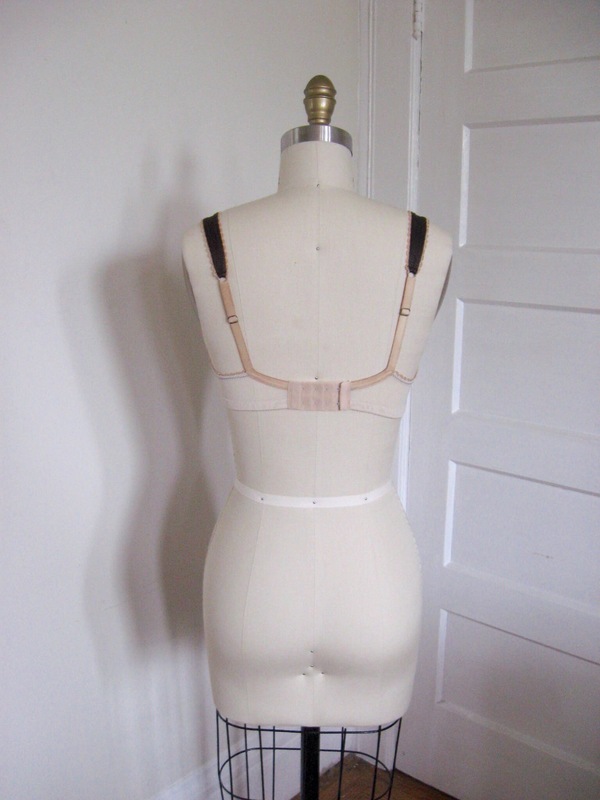 First up, I have another rendition of the Linda bra, a partial band design by Beverly Johnson. I had made this bra twice before with limited success – one was unwearable, and the other was good enough to wear but certainly not perfect. In this third version, I narrowed the bridge a tad, since it was too wide in my brown version, and also gave myself a little more length across the top of the cup. This is definitely my best version so far, but after comparing this bra to other finished versions of Beverly’s bras, I’m beginning to wonder if perhaps I’m making it a size too small in the first place. I’ve been sewing a 32A, since that most closely matches my measurements according to this pattern, but I usually make 32B (that’s the size I use for both the Watson and the Marlborough, and my usual RTW size). 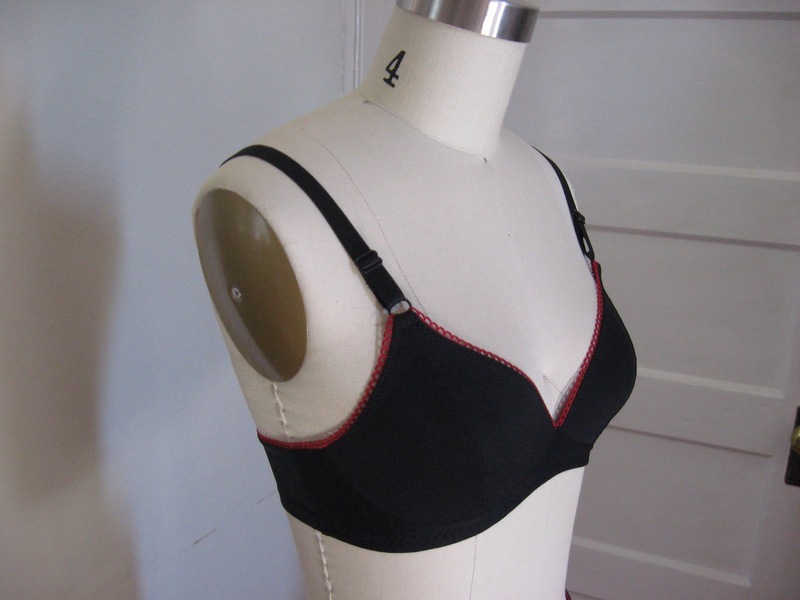 In fact, I was fitted for a bra recently, and they said I could even go up to a C (I’m highly skeptical). Since all of the other versions of this bra that I’ve seen have more breast coverage than mine, I’m wondering if I should approach the fit from the next size up. It may also be possible that partial bras just aren’t the best design for my chest structure. My next bra is another Watson bra, with undies to match. I continue to love this pattern, especially with the addition of foam padding. For this version, I used both foam padding and fold-over elastic for a very sleek, streamlined look. I’m really loving the result, and this has become my go-to “dark colors” bra. Adding the fold-over elastic required a few changes to the pattern – shaving off 1/4″ at the neck/underarm elastics and 1/2″ at the bottom band. I also used FOE for the straps, which required a little elastic gymnastics – I may end up trying to do a tutorial on this, if I can get myself organized enough! For the foam padding, I used the same technique as last time, and this time added a little ribbon to the cross-cup seam for a nicer finish (it also feels smoother!). I know, I know, it’s been a million years since I last posted. I have no excuse. No, I take that back, I do: America’s Test Kitchen. All 15 seasons of the show. Bam. Hence the lack of blogging :P.
Ok, that’s not completely true; I’m also just not as jazzed about these latest bras as I have been with some of my others. I mentioned in my last post that the Marlborough bra is the best fitting underwire bra I’ve made, and today I have the other underwire bra to show you. I.e., the less successful one. 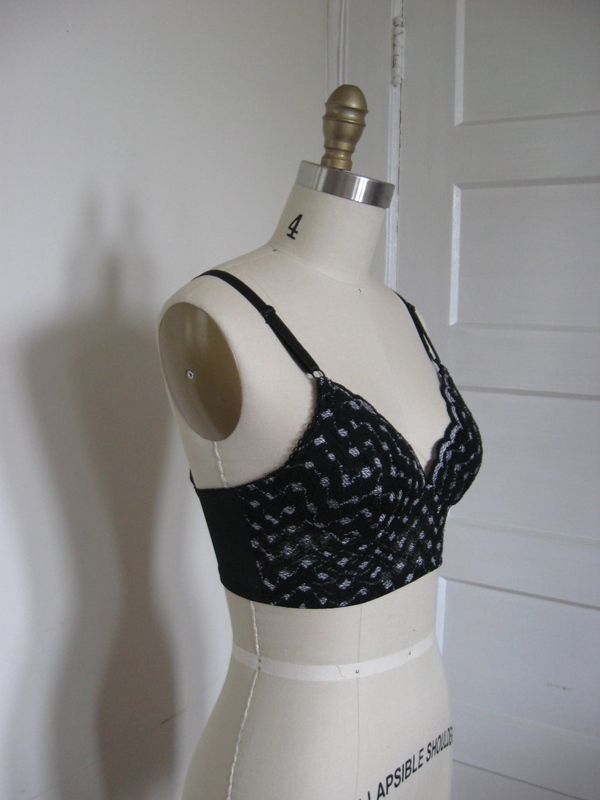 This is the Linda Bra by Beverly Johnson of Bra Makers Supply, her partial band pattern. Now, I should start out by saying that this bra was not less successful because this is a bad pattern – it’s a great pattern! I just had a harder time with fit because of my particular shape, and haven’t yet created a truly successful version. For version 2, I added about 1/2″ of length to the upper cup and also widened the bridge a bit. The cups fit much better this time, but now the bridge is too wide. Argh! But I’m definitely getting closer with this bra. 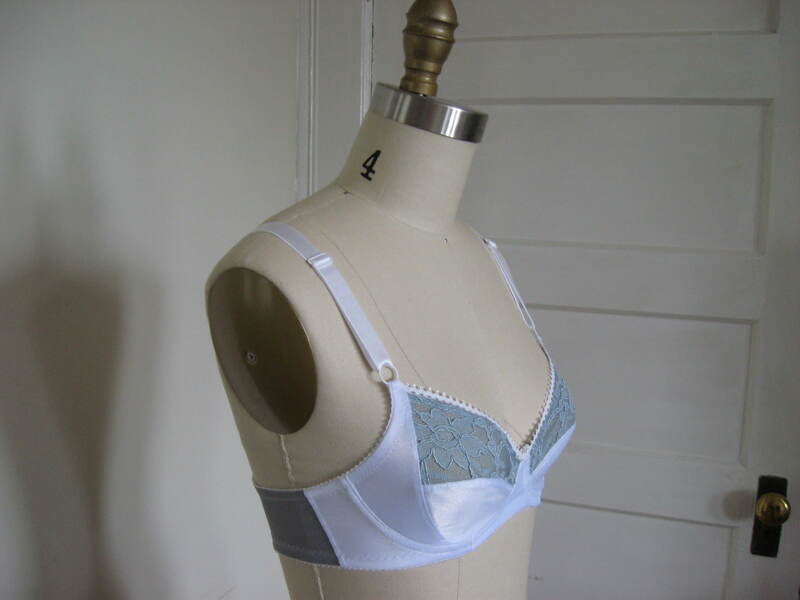 I do love lacey bras – they’re so gratifying to sew! One thing I’ve realized in my bra making journey so far is that I have fairly wide-set breasts, so patterns with power bars tend to create a more flattering shape than those without. As a result, this bra still allows the breast tissue to “spread” a little more than I would like, while the power bar of the Marlborough gives a really nice shape. So now I’m toying with the idea of converting the Marlborough to a partial band using the method Beverly Johnson discusses in her mind-blowingly awesome second Craftsy class. 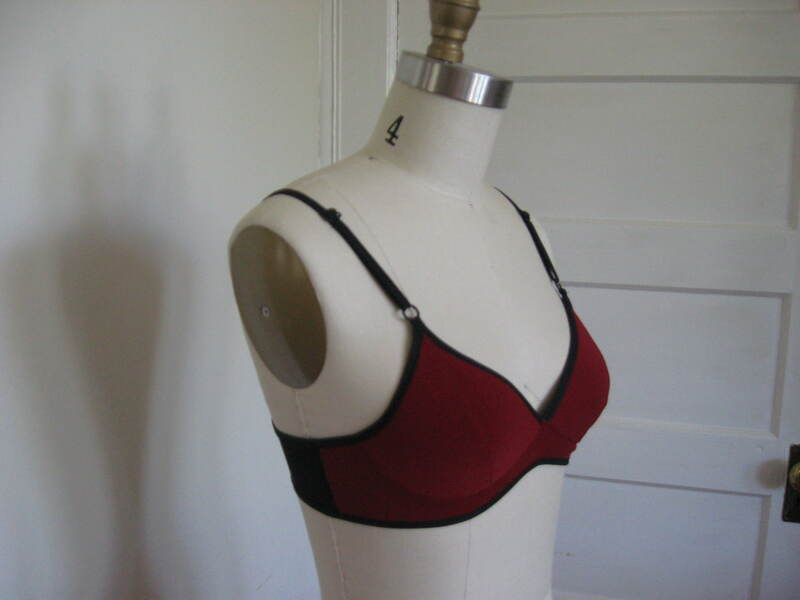 (Seriously, if you haven’t seen this class and are at all interested in bra making, go watch it now) While I want to nail the fit with this bra, I’m wondering if it would save me some headaches to just alter a bra I already know works. Any thoughts on that? So, those are the latest bras! And I’ll give you a teaser about my next post (so you don’t stop reading my blog entirely out of boredom :P) – JEANS. Woot! Happy Valentine’s Day, y’all! I hope you are able to spend some quality time with the folks you love today :). I’ve got some awesome cooking plans for me and my man, so I’m pretty pumped! Oh, and in the spirit of the day, I thought I’d show y’all my underwear ;). That’s right, it’s happened, my friends. I have finally fallen down the lingerie-making rabbit hole. With what seems to be the entire sewing blogger community stitching up their own intimates, I decided it was high time I joined the fray! I still remember the first time I thought about sewing bras. A little less than a year ago, Tasia at Sewaholic posted about her experience taking a bra making class, and showed off her lovely first makes. I remember thinking, “oh, that’s cool, but I’ll totally never do that.” But then she kept posting her gorgeous makes. Then I discovered that Madalynne was doing it too. Then pretty much the whole sewing community jumped in when the Cloth Habit Watson Bra pattern came out, and I was that one awkward kid standing alone at the edge of the pool while everyone else was already having fun. MY TURN. So now here I am, five bras older and wiser. So far I’ve just been working with the Watson Bra pattern, but have plans to branch out soon. I had wanted to start out with one of the fun kits by Grey’s Fabric or Blackbird Fabrics, but they were both sadly sold out at the time I got the pattern, so I decided to be adventurous and get my own supplies. It turns out Britex has a lot of bra making materials, so I was able to get everything I needed there. 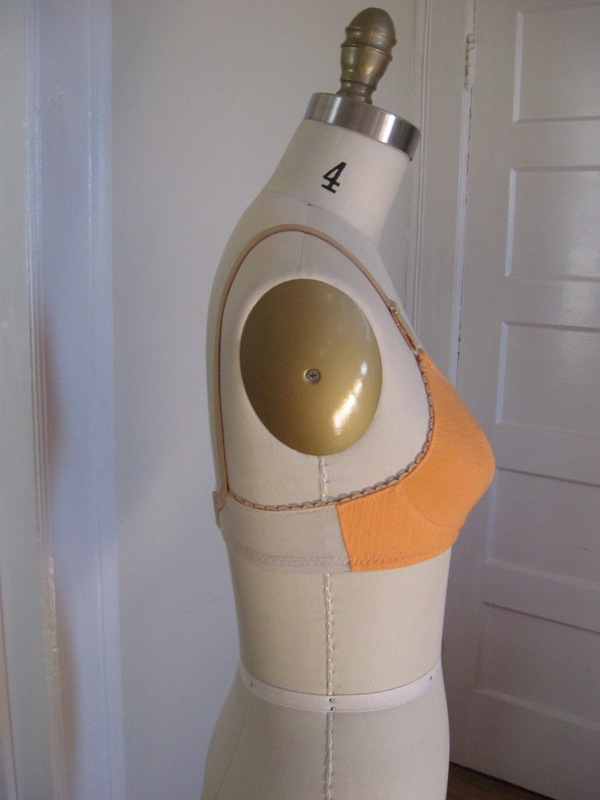 I’m actually kind of glad I had to figure it out on my own – I already feel like I have a better handle on the whole bra making process after spending the time figuring out materials. My store-bought bra size has always been a 32B, but when I measured myself according to Amy’s instructions, I was more like a 32A, so I went ahead with the smaller size. The nice thing about bras is that they’re fast and don’t require a ton of fabric, so you can always make another one! I made my first attempt out of a random scrap of knit fabric and some swimsuit lining (I quickly discovered that I had gotten the wrong kind of lining on my first trip to Britex – oops! ), and was actually quite pleased with the result. …and I made matching undies! I’ve literally never cared about owning matching lingerie sets before in my life, and now all of a sudden, I want to make ALL THE MATCHING SETS. In fact, I never really cared about my lingerie in any respect before now, and the only time I willingly entered Victoria’s Secret was to shop for appropriate wedding undergarments :P.
So, of course, after two bras, I was just getting started. Ha. To avoid overwhelming you with too much more info in one post, I’ll save most of the rest for later. But since it’s Valentine’s Day and all that, I thought it’d be fun to show off my lingerie for the occasion :).